I'm not sure I remember the last time I've heard so much negative feedback about a new album. Typically I don't pay much attention to any of it, at least until I've submitted my own review of the product. But with THE HAUNTED's "Unseen" you could throw a pencil out the window and have a good chance of hitting someone that's jabbering on about it. Consequently, to say I wasn't expecting the worst would be a bald faced lie. For such a sharp departure from THE HAUNTED's relative "norm," including the progressiveness of "The Dead Eye", and given the bleak picture that's been painted, my first thought was, "hey, this isn't so bad". And then I kept listening. That first song, "Never Better", is a bit of a shock, particularly the vocal patterns from Peter Dolving that are as close to rapping as anything else. The chorus at first seems kind of catchy, at least in a commercially-oriented sense. From there forward the journey is wildly uneven, dipping into styles of metal that aren't so much a problem because of the commercial orientation (good music is good music after all), but because they don't usually work very well and at times are just plain embarrassing. Such is the case with "All Ends Well", which comes off like a bad DANZIG remix masquerading as a dark pop song; awful. The same goes for the utter failure of "Motionless" and the mainstream blandness of "Disappear" and "Catch 22", both of which would in all likelihood make the average long-time fan feel irked and disappointed at the very least. After the first minute or so of "The Skull" things return to a thrashier territory more akin to the material on "Versus", except for the PANTERA style vocal bits, and then it shifts to a clean melodic chorus, which would be fine if it had a hook. "No Ghost" almost gets hopes back up with its mid-tempo, tough grooves, only to bring one back to the reality that it too is forgettable. 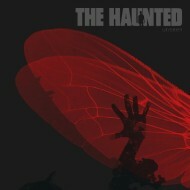 Forget about the stellar (for the most part) material that THE HAUNTED has released in its career and try to look at "Unseen" in isolation. I've tried it spin after spin and keep coming back to the opinion that it's a very weak album. At least the expansiveness of "The Dead Eye" worked in a sense that was progressive, yet still rooted in a beloved style. "Unseen" doesn't come anywhere close to being that type of album. There is nothing wrong with pushing boundaries and spreading wings, but this is just…not good. A 4/10 might is probably pushing it.